This week we learned, to our horror, that North Korea’s dictator has successfully “miniaturized” nuclear warheads that can be mounted on ICBM’s that the North has already demonstrated. News outlets have heightened concerns that any military exchange with North Korea may now amount to “Mutually Assured Destruction,” a term that resurrects the cold war threat that existed for decades with the former Soviet Union, until President Ronald Reagan (with the assistance of British Prime Minister Margaret Thatcher and Pope John Paul II) masterfully engineered its collapse. The Soviets, due to an economy destroyed by socialism, and the prospect of losing militarily in the event of nuclear conflict, threw in the towel. President Reagan was of course deemed reckless and trigger-happy by political opponents and the media, but the results spoke for themselves. From that time (1989) to this, the world has slept better knowing that Russia was reduced to its former geography, millions of east Europeans are free from the degradation of Communism, brutal police state abuses, and the Russians are in no position to threaten military conflict with the United States, let alone act on it. The leaked intelligence report that consumed every news outlet this week claims that North Korea has already constructed some 62 miniature warheads, capable of being mounted atop missiles of a range that can target the American homeland. No missiles have been fired in anger, but the war of words went ballistic this week. North Korea claims that it can reduce America to ashes any time it gets ready. This boast is not new, they’ve been spewing these kind of threats regularly, even displaying computer animation depicting a nuclear strike on an American city. For the first time in a long time, newspapers in Guam and Chicago are publishing instructions as to how to react in the event of surviving an initial nuclear blast. The only overweight little man in North Korea appeared to threaten the island of Guam in one of the verbal exchanges this week. Everyone has heard President Trump’s retort that the North will be met with “fire and fury the likes of which the world has never seen,” this week. The mainstream press is horrified that the man they’ve spent months calling “unhinged,” “mentally deficient,” “emotionally immature,” and so on ad infinitum, just might knee-jerk us into nuclear war. That seems highly unlikely unless the obese bad haircut should actually unleash missiles aimed at Guam, South Korea or Japan. Were that to happen, no doubt the fire and fury would commence, and there would be enormous loss of life in East Asia. Even the prospect of war with conventional weapons presupposes massive loss of life in North Korea, South Korea and Japan. If North Korea really does have the ability to deliver nuclear payloads and was able to detonate one on Seoul or Tokyo, loss of life would soar into the tens of millions. President Trump is getting all manner of criticism for “sinking to the level” of North Korea’s dictator in the exchange of threats. In fact it’s pretty clear that mainstream media regard Trump as the crazier of the two. There is no mention of the fact that both Bill Clinton and Barack Obama warned that the U. S. could “destroy” North Korea if push came to shove. This week Rush Limbaugh likened North Korea to a pimple on a pig’s posterior, and said, while they may have nukes, they can’t hit the broadside of a barn, so to speak, with their missiles. That’s reassuring to Americans for the moment, but they certainly remain a grave threat to Seoul and Japan even with conventional capabilities. And there is news, even in the mainstream media, that back-channel communications are taking place between the United States and North Korea. The story goes that North Korea slammed the door and discontinued the communications during the last six months of the Obama tenure, but that there have been active communications continuously since the Trump inauguration. The last word, for now, seems to be that the United States is “locked and loaded” for military action if North Korea does anything to harm Seoul, or Japan or Guam (population 162,000) where the U. S. maintains both a Naval Base and Air Force Base. Some will disagree, but it’s about time we had a President who is committed forthrightly to the protection of the United States, its territorial possessions and its allies. Media outlets will continue their full-throated onslaught against everything he says and does, because he’s committed to dismantling as many of the socialist, big-government, anti-American policies that were thrust upon us over the past eight years, as possible. He’s had only limited success thus far, but it’s early in his term and his intent seems clear. As far as the nuclear threat from North Korea goes, as the President has said repeatedly, “We don’t believe in government, we believe in God.” As proud as we may be of our military, we hope that our service men and women share our faith in a Higher Power as well. As crazy as everything has become, we know, as our founders knew, that God’s grace, forgiveness and mercy are the keys to our sustenance and safety. The world is increasingly in a dangerous place. Does the Bible hold the answers, or any answers, as to what lies ahead? North Korea, China, Russia, —- Islam. The West, the Anglo-Keltic and European nations are facing unprecedented threats in the post WWII era. Here is a book that brings to life the prophecies of the Bible, especially concerning the modern day Israelites – and no, they are not all Jewish. The Jews, Judah, are but one tribe of Israel. Most people have never heard of the other Tribes. What happened to them? Where did they go? Christ sent His disciples, the twelve Apostles, to the “Lost sheep of the House of Israel”. They were lost from view. The Apostles knew where to find them. And this book will show you where they are today. 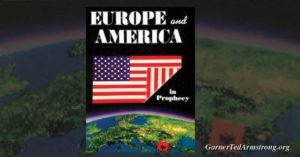 Call or write for a free copy of “Europe and America in Prophecy”.